Los Robles Greens Golf Course in Thousand Oaks, California was recently honored with a 2nd place finish in Golf Inc.’s “Renovation of the Year” competition. Led by Fry/Straka Global Golf Course Design and Arcis Golf, the innovative redesign was one of five public course renovations to be recognized by the magazine. Commended by one of the judges on the panel for utilizing “innovative and forward-thinking planning”, the team took the project a step forward from its initial goal to reduce water usage, and integrated a refreshing redesign of the course. When a severe drought wreaked havoc across California, it resulted in significant state restrictions on water usage. With the city of Thousand Oaks wanting its 1960s-era golf course to be environmentally beneficial, Ed Easley, Senior Vice President of Construction and Director of Agronomy at Arcis Golf, turned to golf course architect Jason Straka to create the renovation plan due to his strong environmental background. Straka’s idea was to use the 2010 make-over of the famed Pinehurst No. 2 course in North Carolina as a blueprint. He traveled to Pinehurst to consult with resort officials to learn what worked well and what they might have done differently. The course remained open during the remodel, so crews had to work around ongoing play, even when redesigning bunkers and replacing irrigation. From the 100-acre course, they removed 30 acres of irrigated turf and naturalized 40 acres with more than 55,000 drought- and pest-resistant native plants. The project’s landscape architect Brian Brodersen dedicated much time to leading the selection of plants and assisting with their planting locations. Upon completion, the overall impact of the project was a drastic reduction in the use of water, fertilizer, pesticides and fossil fuels. 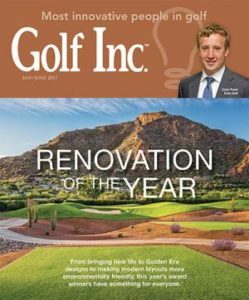 Golf Inc. Magazine annually recognizes top public and private golf course renovations, with scores awarded based on how well each project achieved its stated goals, the level of improvement in playability and maintainability, and course aesthetics. Winners were chosen through a blind judging, with all identifying references removed from the entries.